Top 10 Indian Android Apps! Android is taking off in India. Thanks to a wide range of Android phones available from Rs. 5000 to Rs. 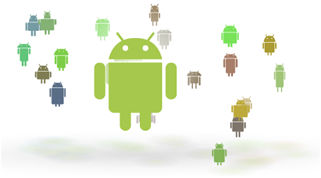 30000, the appetite for Android apps is wide spread. Market place is littered with apps for cricket, Bollywood, news, utility and mosquito repellents. There are close to 1200 Android apps for ‘India’ and only a handful of them are really useful. These top 10 apps are what have surfaced to the top either through downloads or through user ratings. AppBrain, an alternative market place rates these apps based on popularity. BookMyShow (BMS) is a movie ticket booking app, a mobile counterpart to the already popular website. The app has provision to book tickets for not just movies but events like sports, arts and theatre. Unfortunately these are work under progress and not available right now. BMS’s movie section works absolutely fine and is what you expect from a ticket booking site. BMS app works on all Android phones and has seen anywhere between 10000 – 50000 app downloads. The app is free and has a memory footprint of 718 kb. Indian Rail Info app provides exactly what it says. It gives an interface to check PNR status, check trains, check seat availability, train finders and fare enquiry. You can’t book tickets with this app. The app has seen 50,000 – 100000 app downloads and has a average user rating of 4.5 as rated by 1281 people. Popularity of this app befuddles me. An utility app for sure, but most of its popularity is derived from the popularity of Indian railways itself. Alas there are quite a few rail apps, I wonder who this particular app shot to the limelight. PNR status can be achieved by sending a simple sms with pnr number to 97733-00000. Zomato is a food guide app for your city. Select your city, your favorite cuisine and you will be provided with options. There is a Discover feature too which provides you with a random restaurant. Just shake the phone and pick the restaurant. The app also provides information about the restaurant and a phone number to call from within the app itself. Pretty cool app for food connoisseurs and the hungry birds. The app works for Delhi, Mumbai, Kolkata, Pune, Hyderabad, Chennai, Jaipur Ahmedabad and Chandigarh. I tried it for Bangalore and it works just fine. The app isn’t a location based app. TazzaGo is probably the only local app you might ever need. It is a location based app which finds out your location from your GPS broadcast and provides you with a bouquet of services including news, deals, and other services. The news stream is from various news sources providing you with the local news. No surprise here. Moneycontrol has become the premier destination for all things stocks. Its Android app is nothing short of that. The app provides various indices in India and across the world along with bullion market updates. There is a facility to search for a scrip and look at its market price and other details. This app has seen any where between 10000 – 50000 app downloads. BollywoodJi is a free app which brings you the latest bollywood news, gossips, movie reviews and much more. There is no dearth of bollywood apps in the market. This app has surfaced to the app amongst other Bollywood apps which is a significant achievement. Hungama has attempted to release two Bollywood Android apps which are buggy. This app space will see a lot of apps. Online free SMS service has a mobile presence. 160by2 is a free SMS service which lets you send free SMS’s with a catch. You get to use 80 characters only and the rest is used by 160by2 to display ads. Its Android app works much the same way. Given the fact that the app works on GPRS, the cost advantage of sending an SMS over Internet might erode. Of the top 10 apps, there are 3 apps which provide railway information and one app which provides Mumbai taxi information. Bollywood, Movie tickets, stock markets and free SMS are all present in the top 10. This is all expected given the popularity of these categories. Two notable mentions in the top 10 category are Zomato and TaazzaGo. These apps have come to the top by their sheer usability and good user interface. TaazzaGo especially is a must have app for all local needs. Two app categories which are notably missing are Cricket and News. NDTV and Times of India are placed at 16th and 17th positions. Android apps for Indian Entrepreneurs & Small businesses! 5 Indian Banks having their own iPhone/Android Apps! It has a vey good design and a must have android application. u should check out this app called as “Link My World “….. its a free app :) for more details see the link below. great compilation of apps…i would further add to it a useful app known as mintm…must to have app as it adds values to your shopping n provide good offers which is worth n useful. Check these LWP out https://play.google.com/store/apps/details?id=com.pranthzware.om. This list is missing Newsco app (precise news summary for Indian news). A very neat simple interface and very fast loading. Interesting Article.I like 160by2 : Free SMS.And one more think I should share with you.I have found an New app whick is for Cricket lovers.It Updates all the News and Live scores.Its Free.You can Download it from https://play.google.com/store/apps/details?id=com.floopsy.indiacricketscores. Dialing by the touch of your fingers is a privilage not possible in the new smartphones. This application will make it possible again. long click will read you the number. short click will dial. Set via the menu a second language to the keypad and you can search contacts in both languages. I also came across this app https://play.google.com/store/apps/details?id=com.mobilehandler.suppapp.pro its cool app….i have installed this on my GF’s mobile and can see her activity and control it remotely :p…. very useful when you forget your mobile! Here is 1 which make a mark in 2012… http://www.freephoo.com/app. this voip app is packed with free calls, great sound and WiFi+3G. u should check out this app called as "Link My World "….. its a free app :) for more details see the link below. I was playing “Bano Crorepati” app just like kon banega crorepati tv show… I think it is very promising and should be in this list soon..
Do you have a list of top iPhone apps in India?